Tannins, which are constituted mostly of gallotannins, in addition to proanthocyanin and condensed catechins. Other; flavonoids; myricitrin, quercitin, astragalin, kaempferol, volatile oil which includes n-hexen-2-al, a- and b-ionones, hexenol. Other; volatile oil, resin, saponins. Used For: The herb is known to treat diarrhea, relieve inflammations, stimulate the organism, calm the nervous system, and prevent bleeding. Witch Hazel is popularly and widely used due to its astringency. Particularly, it is beneficial for both external and internal hemorrhage, as well as treating hemorrhoids. It may be applied to treat varicose veins, swollen inflammations, and bruises. 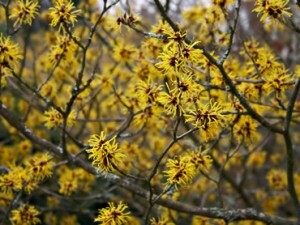 Witch Hazel is applied to treat diarrhea and relieve dysentery. Commonly mixed with: To relieve hemorrhoids, the herb is mixed with Pilewort. Preparation and Intake: To prepare an infusion, take a teaspoon of dry leaf extract for a cup of boiling water and steep for ten to fifteen minutes. The result is consumed thrice per day. Witch Hazel is also used as a topical ointment.